If you need the sound of a real Leslie on a regular basis, this is essential. And even if you don't, it's still highly recommended as a characterful effect in its own right. Stunning recreation of a classic. Versatile. Nice presets. Clear layout. Lush mechanical ambience. 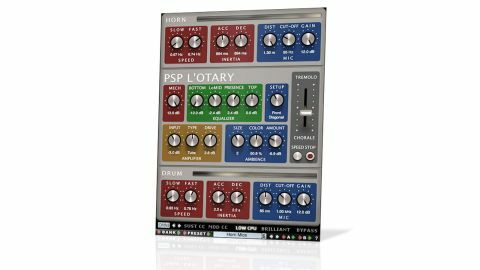 L'otary (AU/VST/RTAS/AAX) is a plugin emulation of the two most revered and classic iterations of the Leslie rotary speaker cabinet: the 122 and the essentially identical 147. It's divided into Horn, Drum and global sections. Horn and Drum handle the main mechanical aspects of the Leslie cabinets they aim to virtualise: a revolving horn speaker and a fixed woofer projecting its sound down into a revolving drum with an open side. Both have the same parameter set, starting with two Speed dials: Slow and Fast (0-10,000Hz), setting the top (Tremolo) and bottom (Chorale) limits of the Speed lever on the right. "Running any of the 122 and 147 staples - Hammond, Rhodes, Clavinet, etc - through it is enough to weaken the knees"
The two Inertia controls (100ms-10s) determine how quickly the drum and horn Accelerate or Decelerate in response to the performance speed control (see Mission control), while the Mic sections let you adjust the virtual distance between each mic and the cabinet (0-1.3m), Gain (-Inf to +12dB) and Cut-off. The last sets the cutoff frequency of a high-pass filter (20Hz-1kHz) for the Horn and a Low-pass filter (200Hz-20kHz) for the Drum. The Global controls occupy the centre of the GUI, beginning with the Mech dial for setting the level of the hypnotic and beautiful mechanical noise of the two revolving speakers (even down to air turbulence). This is present even without an input signal and changes with the speed of rotation. Next comes EQ, with Bottom, LowMid, Presence and Top bands; and the Amplifier, which can be set to Thru (transparent), Solid or Tube Types, and features Input Gain and Drive controls. The two amp models can serve as glorious overdrive effects in their own right, too. The Ambience section follows, shaping the virtual room in which the virtual Leslie is situated via its Size, Colour and Amount knobs. It's a basic setup, certainly, but it creates a convincing sense of space. Finally, the Setup knob is used to position the two virtual mics in relation to the cabinet. Amp- only is perfect for the aforementioned overdrive/distortion, but there are also Front Side, Front Diagonal, Front Rear, Opposite Diagonal and Mono options, representing a range of classic configurations. You only need to play with L'otary for five minutes to come to the conclusion that it's unquestionably the best Leslie emulation ever made. Running any of the 122 and 147 staples - Hammond, Rhodes, Clavinet, etc - through it is enough to weaken the knees. But more than that, it sounds amazing on just about anything, helping to give any signal presence in a mix. We're willing to bet that there's just nothing quite like it in your virtual studio for adding character and distinction to sounds of all kinds. Such beauty comes at a price, though, and in L'otary's case, that cost is counted in CPU cycles. It does offer a Low CPU mode (which still sounds great), but it would be even better if it featured a Diva-style option for automatic draft-quality monitoring/best-quality bouncing. We also think tempo-synced rotation speeds should be added. If you want the most authentic Leslie emulation plugin, this is certainly it. Sure, you can achieve similar results for less money, but L'otary really is sonically a cut above in terms of realism and vibe. Only you can decide whether or not it's worth the asking price for your productions - it certainly is for ours.